In Paris, France, over 80 restaurants signed up to take part in a Spring 2014 pilot project to collect their food waste, which was then used to generate biogas and produce electricity, heat, and compost for farms around Paris. The project has seen huge success. 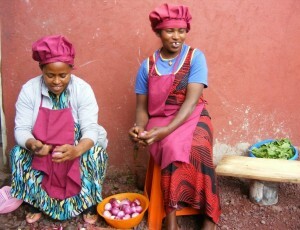 In Ethiopia, a group of women have taken the idea one step further: they are managing a restaurant that will eventually be fueled by human waste. “Food was the main challenge. We survived on love. How else could we survive?” Marefya Tirfu (left), responding to a question about what life was like before the income provided by the biogas restaurant. CFTC’s local partner, Emmanuel Development Agency (EDA), has supported a women’s self-help group which has been running the “biogas” restaurant for the past six months. Located in Akaki-Kaliti sub-city of Addis Ababa, the restaurant will eventually run off the gas from waste deposited in the nearby latrine. “In the end, the methane produced is just like any other gas and goes into your stove just like propane would. And it’s renewable, which means the restaurateurs won’t have the ongoing expense of needing to buy fuel,” Heather Johnston, CFTC’s Director of Programs, said. The project began in July 2013, when a group of women were organized into a savings group. Trained by the government at the local micro-enterprise office, the women came up with the concept of opening a biogas restaurant, and CFTC and EDA stepped in to help fund it. “Group members have also received training in health, sanitation, business and finance, which they say has been invaluable,” Heather added. Six months later, in January 2014, the restaurant opened. While they are still working on creating a stable client base, they are bringing in approximately 1,000 birr a day ($56) in revenue, meaning each woman in the group earns approximately 200 birr a month. Thirteen women are involved in the project, and each works one week on and one week off. Bolstered by the success the restaurant has experienced in its first year of business, the women hope to expand to include a butcher shop in the future. 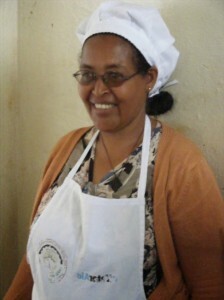 Kelema Haile, a soft-spoken woman with three children, manages the biogas restaurant. Previously, she worked at a local garment factory but over time her eyesight diminished and she eventually had to leave her job as a sewing machine operator. “After 27 years of work I was only making 250 birr a month, and after only six months running this restaurant I am earning 200 birr a month,” she said. Those around her say that Kelema has flourished in her new role of leadership. She enjoys running the business, loves the constant social interaction, and even her health has improved. “This is the work where I discovered myself for the first time,” Kelema said. Enterprises such as this are springing up at increasing rates as microfinance initiatives and self-help groups, specifically targeting women, become more popular. The common ingredient? Women’s ingenuity.